Suuuure, you don’t make wine; it’s all about the special land upon which your grapes grow… the one that is kissed by col fog in the morning, and bathed in sunlight and warmth during the day. 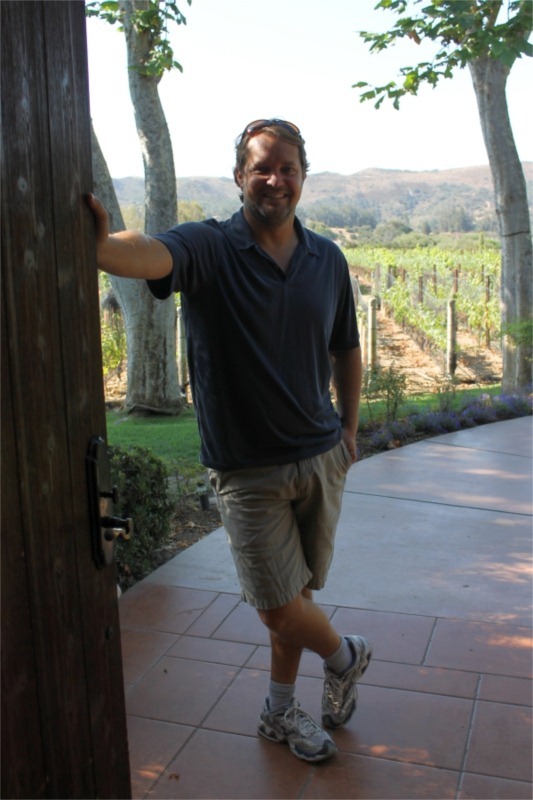 And he is the sales director for his family’s Lompoc, CA wine business, after all (businessman father Ron Melville founded Melville after getting bit by the wine bug in undergrad, and then setting up a grape growing operation in Knight’s Valley; brother Brent is the vineyard manager). But there was a problem with Chad’s sales pitch about their by-hand fifteen thousand case production: it didn’t come off as a pitch. No references to optimal ripeness, no rococo-esque flourishes of over-endorsement or self-aggrandizement. 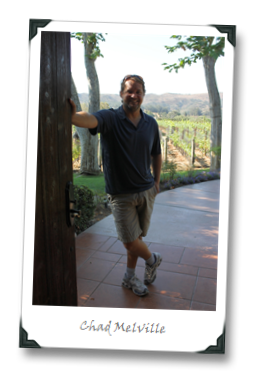 Chad’s non-pitch was interjected with the firsthand knowledge of a guy who helped to establish and develop the vineyards and business that his family owns, and who previously assisted in winemaking at the estate (winemaker duties are now headed up by Greg Brewer). 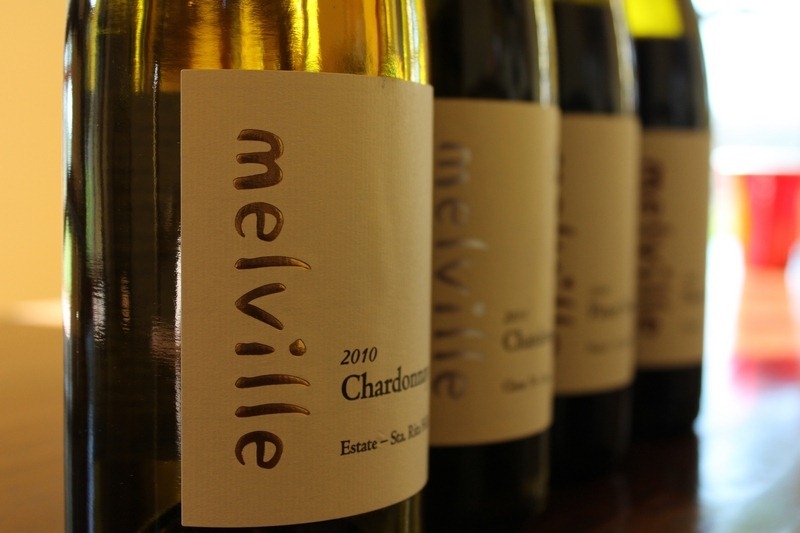 Melville was my first stop on a press trip through Santa Barbara wine country, and it was the stop that ended up sticking with me the longest, because it ended up being a microcosm summary of everything that has me excited about SB as a winemaking region. They’ve got cooling fog and wind (courtesy of the Humboldt current, with mountain ranges that run east-west to funnel in the moderating sea influences), plenty of sunshine, and acid-retaining diurnal temperature swings. 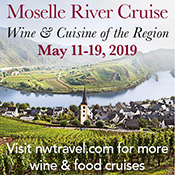 Which means balanced grapes, grapes that are ripe without being overripe, and which usually retain natural acids to give the finished wines some pop. 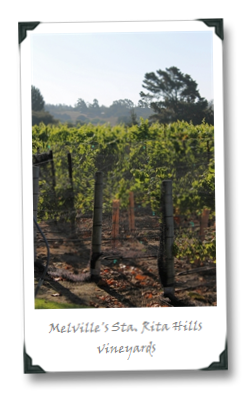 The vines come out of dormancy in Santa Barbara a bit early for California, due to the mild winters, so the growing season is pretty long. In other words, theoretically winemakers dealing with Santa Barbara grapes don’t need to add acid or sugar to turn them into wine, so theoretically that’s at least two fewer adjustments that need to be made in the cellar, both of which could potentially totally f*ck the wines up. 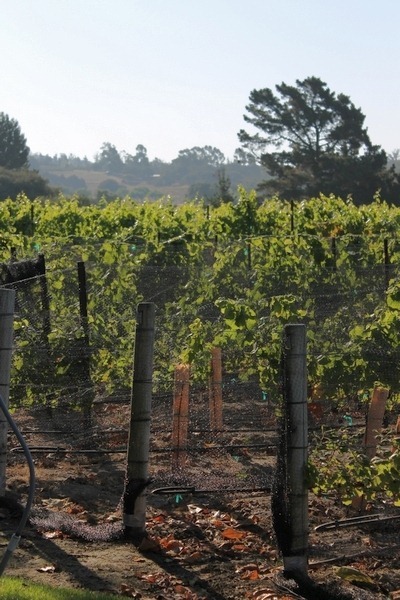 Sandy soils and dense plantings help, but the tech to which Chad was referring were things that a lot of hard-core people will tell you are eventually wine quality killers: drip irrigation, a heavy focus (bordering on obsession) on rootstock and vine clone matches. And yet, the wines do not come off as fake, forced, bland, or lacking a sense of place. From a wine geek perspective, it was flying in the face of some of my geekier preconceived notions. One of the more interesting CA Chards you’re likely to pick up for under $30. There’s a down-pillow like softness from the lees contact, but you’re sitting on that pillow eating a breakfast of racy grapefruit, apples and nuts. You’ll wash it down with crips mineral water. And the breakfast table has fresh flowers on it. Good morning. “There’s no nothing on this wine,” according to Chad Melville; “what you taste is as core as you can get.” And he’s right; everything here is what Chardonnay will give you when it’s not buried in too much oak: white flowers, white grape, green apples, melons, chalky stones. Sounds all light and froo-froo, but there’s depth here on the palate (it’s over 14% abv), it’s pithy with acidity that’s tight and bright. I wanted to f*cking kiss this wine. I think I kind of did, actually. And I suspect my “rating” will be proven wrong, and it will become one of those A-level wines after a few years of development. But I don’t have a reference point so I’m sticking with the B+ and then let’s all hope we are pleasantly surprised later. Chad described this wine as having “lower tone rumble” which as a bass player I found an appealing analogy for a bigger, darker, tighter Pinot. This one is definitely laying down some slow-driving low-end, with the occasional prog-rock flourish of virtuosity that doesn’t destroy the overall groove. It’s too tight right now, but it’s also hinting at what will happen later: spicy richness, plummy red fruits and berries, dark cherry, herbs, chalk, and concentration without obnoxiousness. Long finish, great acidity, textural tannic structure, and – alas – only 626 cases. Understated is the operative word. There’s pepper (yes, in a CA Syrah! ), cherries, plums, a lot of floral notes and more red than blue and black fruits. Hell, it’s even got some citrus rind and refreshment going on; on the whole, this is a breath of fresh air from the flood of heavy-handed CA Syrahs out there. I found it a geeky wine, but it’s Melville’s “number one seller” according to Chad so what the hell do I know. 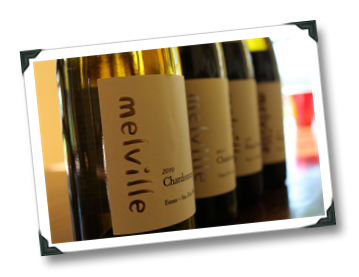 I am a big fan of Melville–did you happen to go through either the Terraces Pinot or the High Density Syrah? Thanks, Dana. I've been contemplating going back to the notes from that trip and writing more about SB. More to come! Winemaking is so interesting. I visited a few cellars and I was really impressed with all the knowledge that lies behind making great wines. I hope to taste a few of the wines on your list some day.